Trust is born out of transparency and caring services. Hovi Care is an independent, family-run chain of care service companies. We are now operating already in a second generation, with six units in Finland and one in Singapore. Hovi Care has its roots in Finland, where the first nursing home was founded already 30 years ago. The parents of the owners are still active, even if they are well over 70 years old. The operations have held to the initial value base throughout the years: Hovi Care services are from a family to a family. We understand that families worry about their loved ones and we strive to meet their expectations. We do that by transparently working together towards a common goal: the wellbeing of our client. Finland is all about independence and self-reliance. We feel that our role at Hovi Care is to give our customers the best chance at an enjoyable life, to learn new things and have meaningful new experiences every day. As our service pledge “Own Your life“ indicates, at Hovi Care we believe that a good life involves valuing a customer’s individual choices, openness, transparency of operations, positive outlook and a memorable service experience. Individuality means that all our decisions are made based on the elderlies needs and wishes. The senior is valued as an individual with their own habits and personal requirements, respecting and fostering their right to act autonomously. Mutual trust is like a glue that binds the community tightly together. Trust between the family and us is born out of the transparency of our operations. You are welcome to see us at any time. We are constantly developing our care services and our staffs know-how. 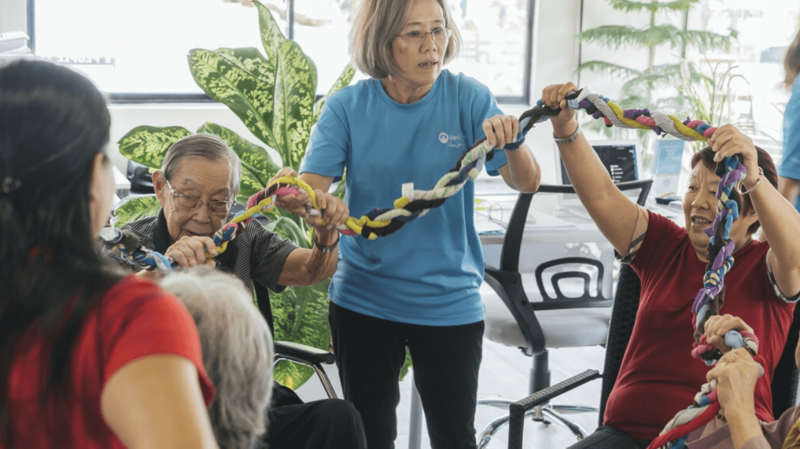 Our service must always be of excellent quality, and thus it’s critically important for us that our team members are top level professionals with a genuine desire to serve and care for the elderly. With open interaction between our staff, customers and their families, we ensure things remain simple and issues are resolved. Our role is to function as an inspirational enabler of new experiences and a safe and secure guide. We want each elderly to feel that they are truly cared for and that they are receiving a memorable and warm service experience every day. as we would offer to our own family members. and requirements, with respect for their right to make decisions. interaction between staff, clients and their families. Environments always have an impact on emotions and the vitality of the mind. As such we strive to create surroundings that stimulate the mind but still remain calm and relaxing. We use the newest technologies to try out different stimulating service experiences and entertainment. To counterbalance this we also devise experiences with elements from nature, which often bring with memorable recollections from the past. Simplicity and clarity are also important to our elderly, so that each individual may feel safe. Safety is reflected not only in the way our care environments are designed but also in various safety technology solutions that simultaneously support our carers work. To live a full and eventful life, despite disabilities, elderly´s well-being is a combination of physical, social and mental health. We work actively together with our local partners so that we can deliver an extensive service experience. Hovi Care is an independent Finnish family-run chain of care service companies with 30-years of experience. Its care service units employ over 100 professionals who give each unit a face, character and all the energy that a safe and inspiring atmosphere commands. On each market, we operate in collaboration with local people, as it’s important to our customers that Hovi Clubs are safe and familiar places with all the things dear to our clients in their own culture. Our operations all over the world are very straightforward. We take a fair and human approach to both customer service and partnerships. We think that a good life consists of very small, but ultimately very meaningful things. We feel that our role at Hovi Care is to give our customers the best chance at an enjoyable life, to learn new things and have meaningful new experiences every day.